Our telephone is answered from 8 am to 5 pm (CST), Monday to Friday. 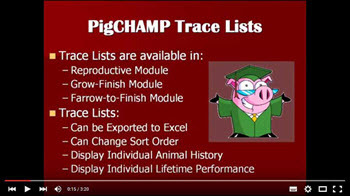 The data from PigCHAMP reports can be exported to Microsoft Excel for review, analysis and sharing among colleagues. Exporting data is easy! Simply select the processed report in the report queue, and then select the Trace List tab. You can then choose to export Trace Data or Summary Data. Select the Excel icon located above the report. Browse to where you'd like to save your Excel file, name the file, and press save. You can find step-by-step instructions on our FAQ page or in the Help Files in your program. More information about using Trace Lists, including exporting data to excel, can be found in the following YouTube video. Customers who participate in PigCHAMP's Benchmarking program are reminded to send us your 2014 year-end data by January 31. Results will be tabulated and highlighted in our annual Benchmark magazine and on our website in the spring of 2015. You can view summaries from previous years on our website. If you're not currently participating in the Benchmarking Program and would like more information or would like to join, visit our website or email Susan Olson at benchmarking@pigchamp.com. PigCHAMP staff are hitting the road to bring you the latest in swine management software technology. What makes PigCHAMP the best in the industry?